Address: Floor 2, building A, no.46, ailianpu road, longgang district, shenzhen, China. 30 hours of endurance time: They're made to keep up with you, thanks to a charging case that holds multiple additional charges for more than 30 hours of listening time. Simple operation: Single-click: play/pause, answer/hang up. Double-click: Volume +/-. Triple strikes: Up/down song Long press: Summon Siri on/off. Quick access to Siri: Supports access Siri and Android Voice Assistant for easier and more convenient use. Automatic connection: Whenever you pull your Earbuds out of the charging case, they instantly turn on and connect to your device. [PORTABLE MINI EARBUDS WITH CHARGING BOX]: Image how small it is: 4.1"*0.98". The lightweight and small size charging box easy to carry in your pocket or bag.With 850 mAh battery can support up to 5 charging times of 45 mAh ear buds full charged with only 1 hour. Aslo provide emergency charging for mobile phone.IPX-7 rating dual ears that can withstand heavy perspiration,rain and shower.Perfect for running, biking, training, jogging & gym exercise,watching TV,or sleeping. 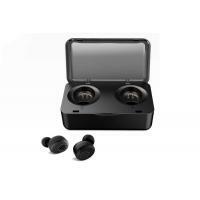 [TRUE WIRELESS EARBUDS WITH BLUETOOTH V4.2]: In-ear bluetooth headphones which can be used separately, connect two devices simultaneously, truly cordless earbuds stick to your neck when you sweat. Built in Microphone With Long Battery Life:The in-ear mini twins earbuds with mic for hands free phone and listen to music.The 45mAh lithium polymer battery and 1 hour charging time allows seamless enjoyment of 3-4 hours premium quality talk/play time and 100-150 hours standby time after fully charged. [BLUETOOTH 4.2 HEADPHONES]: Bluetooth V4.2-Bluetooth V4.2 high version of the Bluetooth chip, connect faster. More compatible Compatible with computers, iPhone x / 8 plus / 8 / 7/ 7 plus, iPhone series, iPad, tablets and Android smart products.The connection is more stable and owns 32.8 feet connection distance. b. Mass production: Bluebay brand: 3-30 days upon order confirmed subject to the stock situation. b. Big Order: ocean shipment or air freight are available. Q1: What standards does your products meet? A1: Our products can meet BQB, FCC, CE, RoHS, Telec standards as your requirements. Q2: What is the defective rate of your products? How about the industrial average rate? A2: The defect of our products is less than 1%, while the industrial average defect rate is 3%. Q3: What's your MOQ requirements for distributors/agents? A3: We have general distributor and sub-distributors for our BLUEBAY products, in general, the MOQ is 500 pcs. Q4: What kind of payment terms can you accept? A5: Yes, we will send a confirmation sample to you according to your request for approval. Q6: What is the minimum order quantity for products? A6: 1000 pcs for OEM & ODM, 200 pcs for BLUEBAY brand. Q7: How many spares to be sent for each thousand pcs ordered? A7: 0.1% for each thousand pcs order.